This two-day conference will bring together researchers with diverse interest sin indigenous cultures, languages and histories from a range disciplinary backgrounds with the aim of exploring research findings, concepts and methodologies. The conference is a collaborative initiative between scholars at the University of Sheffield, UK and the Universidad Autonóma de Zacatecas, Mexico. While this conference will build on existing links between scholars in Mexico, USA, Poland, Spain and the UK, we are looking forward to welcoming many new faces to our collaboration. We are delighted that Dr Justyna Olko (University of Warsaw) and Dr John Sullivan(Universidad Autónoma de Zacatecas and University of Warsaw), leading figures in the revitalisation and preservation of the indigenous Mexican language Nahuatl, will deliver a keynote address. 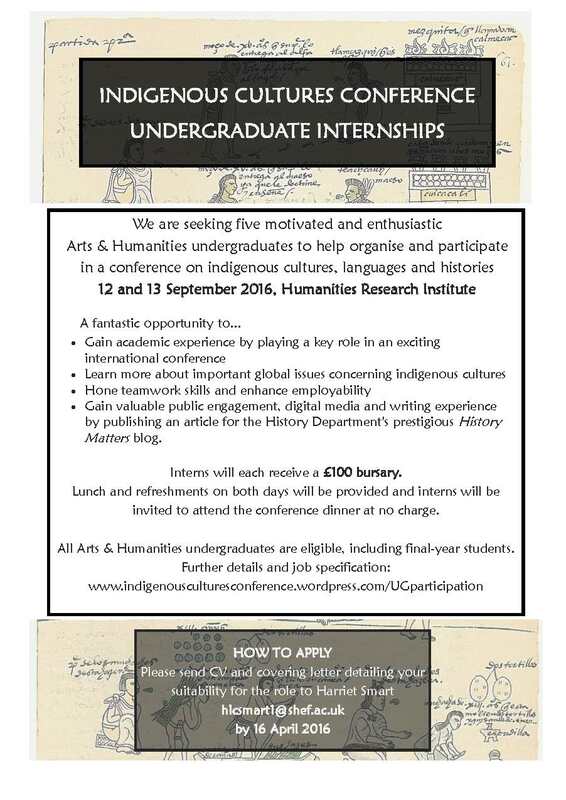 We are seeking five motivated and enthusiastic Arts & Humanities undergraduates to help organise and participate actively in the Conference. By attending both days of the Conference and assisting the Conference Organiser, this is a fantastic opportunity to gain academic experience and to learn more about important global issues concerning indigenous cultures. Please note that all Arts & Humanities undergraduates, registered at the University of Sheffield, are eligible to apply for these positions. For further details regarding the Undergraduate Internship roles, please consult the poster and internship job description. Please note the deadline of 16 April 2016 for applications. If you have any queries please contact Harriet Smart, Conference Organiser, at hlcsmart1@shef.ac.uk.